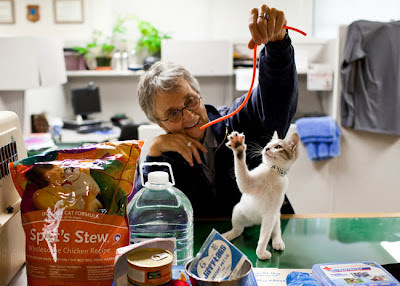 San Francisco Disaster Relief-Pets Included! We ran across this article in The New York Times from last month and thought it was worthy of discussion. We were heartened to learn that San Francisco has taken the lead among major cities preparing for potential emergencies - in San Francisco's case, earthquakes-to include pets in their disaster planning efforts. Here's the new mantra, at least in the Bay Area: "Take your pets with you " in the event disaster strikes! According to this piece, "San Francisco's pet-centric approach to disasters represents the vanguard of a national trend in post-Katrina disaster response that takes pets into ever-greater account...Now Animal Care and Control has a role alongside other rescue agencies." In fact, the city has received $350,000 in federal funds over the last three years "to supplement local animal disaster preparedness." We think this value being placed on pets is long overdue. After all, most of us feel like our pets are bonafide members of our family-and who wants to leave a family member behind during a disaster? We applaud the city of San Francisco and others emulating this model of comprehensive disaster relief. How would you feel if your were forced to leave your pet(s) behind in the event of a disaster of some sort? Do you think federal funds should be allocated to municipalities for animal disaster relief? Let us know! We don't have those programs here... but I know my mom would not leave me behind.... never. Glad they are implementing them there! We wrote about disaster prep this week too! Mama got to learn all about a group in our area that specializes in Animal Rescue during disasters. They showed Mama what to pack in our "Grab It n Go" disaster bags and helped Mama make a plan! It was great! Thanks for letting us know, Kolchak-we're off to check it out!